What do transportation, transit and trees have in common? Besides beginning with the letter “t,” they are all important ingredients for helping commuters get around west Metro Atlanta in a more seamless, connected and visually appealing way. While the Town Center and Cumberland community improvement districts (CIDs) are excited about the potential of MARTA coming into Cobb County, the Boulevard CID, in southwest Fulton County, is investing heavily in landscape improvements, streetlights and gateway signage. This summer, the Boulevard CID completed a streetscape project at the interchange of I-20 and Fulton Industrial Boulevard. The project included all new landscaping that stretches a half mile north of the interchange and a half mile south along with streetlights, trash cans, brick pattern crosswalks, gateway signage with the CID’s logo, curb repair and a “beauty strip” throughout Fulton Industrial. There is also an area 20 feet in diameter reserved for a public art display on the I-20 westbound off-ramp. The Fulton Industrial corridor is one of the largest industrial corridors in the eastern United States. It consists of about 5,000 acres of industrial property and includes more than 46 million square feet of industrial space and more than 550 industrial buildings. “There are about 25,000 jobs in the district, representing more than $1.5 billion in payroll,” Prado says. Next up are landscape improvements at Camp Creek Parkway and Fulton Industrial Boulevard. Currently there are incomplete sidewalks, no streetlights and only a few trees in the area, according to Prado. Improving the intersections of Camp Creek Parkway and Cascade Road at Fulton Industrial are also top priorities. The Georgia Department of Transportation was working on intersection improvements at Camp Creek and Fulton Industrial this summer, while the Boulevard CID is in the design phase of improving the Cascade Road intersection. In 2016, $1 million of Transportation Special Purpose Local Option Sales Tax (T-SPLOST) proceeds were earmarked for the Cascade Road project. Improvements could include dedicated turn lanes, and construction is expected to begin next year. “It’s a bottleneck, and we’re trying to come up with strategies to relieve that,” Prado says. Cobb County has long been a bastion of “Never MARTA,” but in November 2019, residents will vote on how, and if, to expand transit in the county. That could change, however, thanks to the passage of state HB 930, which allows individual counties to pass a penny sales tax to fund transit. It’s expected, if voters say yes in November, that the retail sales tax would generate $145 million to $150 million a year in Cobb County. “Cobb is working on a transit study now on how and where it might make sense to connect to MARTA,” Leithead says. “Options range from bus, flex bus, BRT [Bus Rapid Transit], light rail or heavy rail, and they’ll be [ranked] in order of cost versus return on investment. The CIDs and the chamber are participating in that conversation.” If approved by voters, the county could raise as much as $4.5 billion over the 30-year life of the tax. A provision in HB 930 gives Cobb an additional option of creating a special taxing district – in one section of the county – to support transit. If the county chooses this option, the board of commissioners and members of the local legislative delegation will draw the boundaries of the district and come up with the project list to put before voters. If the commissioners decide against that idea, they would create a countywide project list for voter approval. As home to the 36,000 students at KSU and more than 100,000 employees, the Town Center CID has travelers from the north, east and west creating through traffic, as well as regular commuters and visitors within the district creating a need for increased access and multi-modal transit options. According to Rathbone, the Town Center CID has been studying the topic of transit in the district for nearly two decades, working with the Cumberland CID to identify paths for regional connectivity. During the Cobb Chamber’s strategic planning process in 2017 to prepare for 2018-2022, the chamber talked to more than 1,000 business leaders across the county through interviews, focus groups, surveys and input sessions, according to President and CEO Sharon Mason. Expanding transit and mobility in the county is critically important to prepare for the region’s continued growth and to remain competitive for job creation and retention as the No. 1 state to do business, Mason says. “We support moving forward with input from citizens to determine the best option for Cobb that would connect with the region and believe that our future success as a county, region and state depend on our current and future transportation challenges being met and overcome,” she says. Leithead says the Cumberland CID, the Town Center CID and the Cobb chamber are “eager” for expanded transit in the county. While the chamber and the county’s two CIDs are anxious to roll out the welcome mat to more transit in Cobb, at least one county commissioner is reserving judgment, for now. 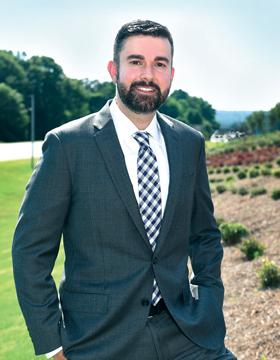 Though expanding transit in Cobb is a hot topic around town, the community’s business leaders know there is no single solution for curing the county’s traffic woes. Luckily, there are several major improvement projects already underway. The Town Center CID announced in May that Phase III of the South Barrett Reliever project received $10.4 million in federal funding from the Atlanta Regional Commission (ARC) – the largest award for a regional roadway project during that funding cycle. The grant was released through ARC’s Transportation Improvement Program (TIP), which allocates federal funds for the construction of high- priority projects. The South Barrett Reliever project is the Town Center CID’s largest infrastructure project to date and will cost more than $45 million. Phase III of the South Barrett Reliever includes a bridge over I-75 and the newly constructed managed lanes. It will widen, realign and extend Shiloh Valley Drive across the interstate to a widened Roberts Court, forming a continuous road. Preliminary engineering and design is underway, and Phase III is expected to break ground in 2020. There are two major road projects underway in the Cumberland CID, including a ramp from Akers Mill Road to the new managed lane system. Phase I of the ramp project is under construction, with a total project cost of $40 million. Another north-south route aimed at relieving congestion is the Terrell Mill Connector. The $30-million project is being funded entirely by Cobb County and the federal government, according to Leithead. It may take a while for all of the transportation and transit improvements on the west side of Atlanta to come to fruition, but commuters can look forward to a future with multi-modal transportation options that improve accessibility and mobility for all.